We’ve made some progress with SEO (search engine optimization) lately. Today I’ll discuss our recent improvement in search engine referrals using Jeremy’s Is Batman A Marvel Character Trapped in the DC Universe? and Diana’s Penny Dreadful Séance Review as examples. I know very little about optimizing posts to get searches. It isn’t something I even thought about until a few weeks ago. I had a private conversation in March with CompGeekDavid about blog traffic which made me think this blog, in particular, should be getting more search traffic than is. That prompted me to do what I always do when I encounter a problem like this. I started asking questions, looking at stats, and reading stuff. Jeremy and Diana both get more search engine referrals than me, and they have from the beginning. That’s to be expected. They write a ton of posts about comics, books, movies, and television. That stuff is called “popular culture” for a reason. For the last little while, all my blogging has been oriented toward social media, inequality, photos, music videos, and speaking directly to blogging buddies. I do blog about Tolkien at Part Time Monster, but that’s a pretty narrow niche, and it only trends when new movies are released. 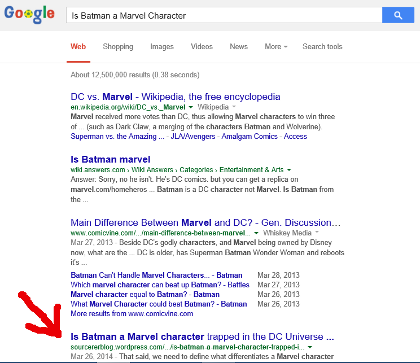 What I write just isn’t as popular, search-wise, as Batman and Penny Dreadful. That said, I don’t think any of us were getting as many search referrals a month ago as we should have been getting. We’re still not, but we have improved our search traffic here in the last few weeks. Two months ago, we were getting fewer than 10 search engine hits a day on most days. Now, on most days we’re getting 50 or more. Both Jeremy and Diana have played important roles in that. She took my advice and it’s working. She’s getting several referrals to multiple posts every day, especially early in the week. I can’t see all the search terms, but I can see enough of them to tell that this traffic is coming from people searching exactly the terms I told her to put up front. Her “Séance” Review from May 19 is already our fifth most viewed post of all time. Diana’s actually been doing a bit of this for awhile, and it’s telling in our stats. Part Time Monster has generated twice the search traffic Sourcerer has generated over the last seven months. Just based on this success, I suggest that referring to things people are likely to search for in your first couple of sentences is a good idea, and I’m going to start doing more of it myself when I can. The second thing that’s happened in the last month is that Jeremy’s StumbleUpon account has become capable of generating views to the tune of a couple of hundred a week, sometimes more. It’s not consistent but it’s happened too many times now to be random luck. In the last 30 days, StumbleUpon has generated more referrals to this blog than the WordPress reader, Facebook, Tumblr, and Twitter combined. Search engines are the only source of traffic that’s gotten us more than StumbleUpon. And we don’t know why. We do know that it doesn’t work from my account, and I have a few theories about that, but I don’t have the space to discuss them today. Now, here’s where it gets cool. We’ve managed, with a happy series of accidents which started with writing a headline, to place a link to Jeremy’s post on page one of most Google searches which include Batman+Marvel+Character. Google is very opaque to me at this point, and it likes to customize searches. But I’ve checked this with non-signed-in browsers on multiple computers. Jeremy’s post is a top 6 post any way I do it. In that search I captured in the screenshot, it’s ranked just below Wikipedia, WikiAnswers, and ComicsVine. And above pages on such notable sites as Reddit and TVTropes. I don’t know what you’ll get if you do this same search from Singapore, but I’m confident that if you do this search from the eastern U.S., you’ll find Jeremy’s post in the top 10. The StumbleUpon incident is pretty amazing, because Jeremy’s blog had only been posting for about 10 days at that point and was doing nothing but reblogs. StumbleUpon apparently doesn’t care about reblogs. The one thing I would love to know, but never will, is how many of the views were people watching the video we included as the centerpiece of that post. It’s a two-minute animated adaptation of the Batman-Superman fight at the end of The Dark Knight Returns, and it is awesome. I’ve read that StumbleUpon rewards good images and videos, but I’ll never know for sure how big a factor that is. Still, the whole incident was very cool. Diana’s Penny Dreadful reviews – ALL of them – rank between pages 2 and 4 on the searches I’ve done. Those posts are competing well with sites like IGN and all kinds of big media, especially given our size, and given the fact that we haven’t been able to get one of those to hit on StumbleUpon. We’re getting 5-10 views on at least three of those posts every day, and have been for most of the season. It has to be the headlines and leads doing that. There’s no other explanation. If I were searching for this article, what words would I use to search for it? Make sure before you publish that you’ve included some of those words in the first three sentences, and if possible, in the headline. I’ll update you as we learn more about search engines and StumbleUpon. If you have any knowledge of either, do feel free to share them with me. If you’re looking for more articles about blogging and social media, take a look a Jessica Leeman’s Social Media blog. Jessica’s looking for guest bloggers. And here’s a post from Infinite Free Time from last week in which Luther shared a lot of his traffic numbers. I found both the post and the conversation we had on the thread very helpful. This entry was posted in Blogwanking, Gene'O and tagged advice, blog traffic, blogwanking, Search Engine Optimization, search engines, SEO, social media, tips by Gene'O. Bookmark the permalink. I’ve been getting a lot more search engine hits in June than I normally do. It used to be a couple dozen hits from Facebook on a good day, and maybe a few from search… now I very rarely get a hit from Facebook at all, but June’s been one of my best months and I’m getting dozens of hits from searches — mainly “Unknown search terms” that seem to be directing people to my home page, so I really don’t know what they’re searching. I don’t think I’m doing anything differently… No idea what’s up. Odd that it’s hitting your homepage instead of posts. Perhaps you’ve gotten yourself a good placement in some history searches. WordPress says it’s likely that we’ll eventually not be able to see any search terms, because google is encrypting searches from signed-in Chrome browsers and G+ accounts to protect privacy. Some of this could be people you know googling you up. I do quite a bit of that when I’m looking for links in a hurry. I always have a search tab open, so until I bookmarked 50 blogs last weekend, it was easier to use the google than it was to go and find people on my blogrolls. Could be, I do that too, especially if I’m on a public computer. and if you google your own blog while you’re not signed into your wordpress account, it counts you as a view. Very interesting and helpful post. Thank you.